Background: One of the major disadvantages associated with using composites is polymerization shrinkage; stresses are generated at the margins, and if these stresses exceed the bond strength, microleakage occurs at the tooth restoration interface which causes ingress of cariogenic bacteria, post-operative sensitivity, and secondary caries. LED offers several curing modes: constant cure, ramped cure, and soft start cure. It is claimed that soft start polymerization mode produces less polymerization shrinkage and consequently less postoperative sensitivity. Objective: To compare the postoperative sensitivity in Class V composite restorations using soft start and constant LED curing modes. Materials and Methods: Using the appropriate burrs cavity was prepared and filled with composite Z 100(3M-ESPE) using a incremental technique. Each increment of 2 mm was cured either with soft start or constant cure. All patients were evaluated at day 2 for postoperative sensitivity. Results and Discussion: Out of 124 restorations that were placed, only three restorations presented with postoperative sensitivity, each one being in mild, moderate, and severe categories, respectively. No relationship was seen between the sensitivity and tooth type. There was no statistically significant difference in postoperative sensitivity in either of the treatment modalities (constant or soft start). Conclusion: We conclude that restorations placed with the soft start curing technique did not show significant changes in postoperative sensitivity when compared to the constant curing technique. It has been noted that patients who present with postoperative sensitivity within the first month of the placement of restoration are more likely to have failed restorations within the first 5 years of them being placed. Treatment of persistent postoperative sensitivity may consequently require replacement of filling,  which in turn increases the cost of treatment, chair side time, and excessive use of trained man power. This is especially a problem in third world countries where resources are scarce and therefore postoperative sensitivity should be avoided. To date, there are very few studies known to us both locally and internationally that have compared postoperative sensitivity using different curing modes. This study will help us in comparing two different methods of polymerization to reduce postoperative sensitivity in composite restorations and will highlight if soft start curing is a better treatment modality than constant curing in reducing postoperative sensitivity in Class V restorations, so that a better technique may be adopted in subsequent patients. A Quasi Experimental study is designed. The sample size was calculated using sample size calculator (sample size determination in health studies, WHO). The level of significance was set at 0.05, power of test as 0.80, and anticipated difference between the two proportions (0.40 - 0.15 = 0.25). The sample size turned out to be 62 in each group. At least 62 restorations were done with constant curing and 62 with soft start curing mode. Nonprobability purposive sampling technique was adopted. It was a split mouth design, the same patient served as his or her own control. Ramped curing was done in the test group while constant curing was done in the control group. Patients having at least two contra lateral teeth with Class V lesions. Only noncarious lesions were included. Patients of ages ranging from 20 to 50 years. Class V lesion extending below the cemento-enamel junction. Patients teeth with gingival recession. Patients using desensitizing agents regularly. Patients teeth having lesions more than 2.5 mm in depth. After taking ethical approval from the University Ethical Review Committee (1198-Sur/ERC-09) patients who fulfilled the inclusion criteria after taking informed consent were recruited in the study. Both the contra lateral Class V lesions were restored under isolation on the same visit. Patients were given (injected with) local anesthesia and gingival retraction, when required, was done by placing gingival retraction cord. Using appropriate burrs, cavity was prepared using the conventional bevel cavity design for Class V lesions, and was then filled with composite Z 100 (3M-ESPE) using a incremental technique. Each increment of 2 mm was then cured either with ramped or constant curing with elipar free light (3M ESPE, Illustration 1) depending if the tooth was in the test group or control group. All the procedures were performed by the principal investigator in order to control examiner variability. Randomization was done with the help of coin toss, and teeth on the right side were treated first. The coin toss decided whether the right tooth received either ramped or constant curing regime and subsequently the contra lateral teeth received the alternate treatment; teeth receiving soft start curing were labeled as group A and teeth receiving constant curing were labeled as group B. Patients were contacted and examined after day 2 and day 7 to assess postoperative sensitivity. Clinically patients' perception for sensitivity was checked using air, hot, and cold stimulus application. All of these were done by the primary investigator. Patients were asked to mark sensitivity according to sensitivity scale. Chi-square test of independence and Fischer Exact test were applied for distribution of teeth and to see the comparison between the ordinal outcome severities of postoperative sensitivity between the groups was done using the Wilcoxon rank test. The level of significance was set at 0.05. A total of 124 restorations were placed and these teeth were equally distributed in all four quadrants. Chi-square test was applied to evaluate the equal distribution of teeth and treatment given which did not show any statistically significant differences in the type of teeth and treatment given (P = 0.74) [Figure 1]. Figure 1: Distribution of teeth restored with ramped or constant curing. Chi square test (P = 0.74). 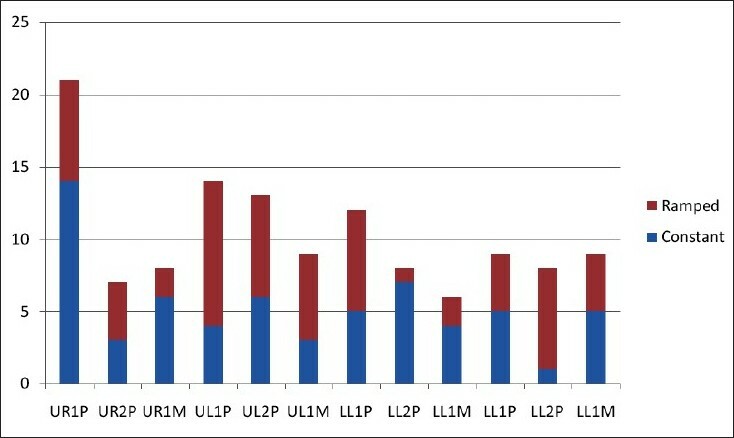 Out of 124 restorations which were placed, only three restorations (2.41%) presented with postoperative sensitivity. Of those three restorations, one was found to be in the mild category (constant curing), one in moderate category (constant curing), and one in severe category (soft start curing), but there was no relation between sensitivity and tooth type [Figure 2]. The Wilcoxon rank test was applied to observe the difference in postoperative sensitivity between the two treatment groups which showed mean rank scores of 62.95 and 62.03 for constant and soft start curing, respectively, with a P value of 0.539 [Table 1]. This shows that there was no statistically significant difference in postoperative sensitivity in either of the treatment modalities. 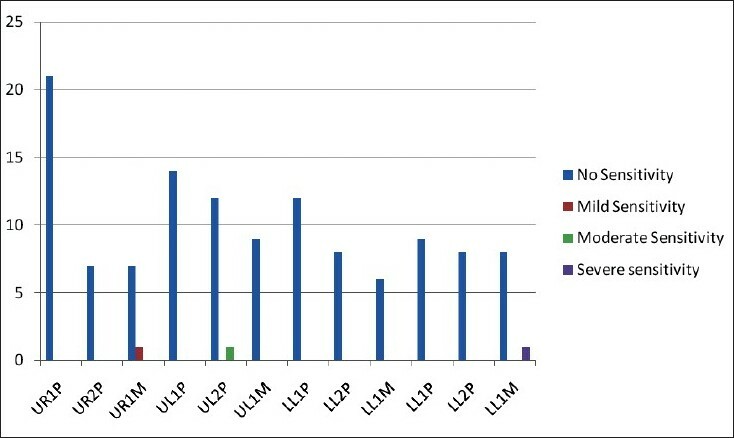 A systematic review was done to look for correlation between in vitro and in vivo studies and it was found that out of the 11 studies identified, nine studies showed that the laboratory data did not match the clinical data and therefore were unable to forecast clinical results; moreover, clinical trials are essential to evaluate the experimental efficiency of adhesive systems. , This was the main reason we chose to do a clinical study. In in vivo studies inconsistency arises due to interoperator variability, as skills, competence, and experience of the operators may vary; for that reason, the primary investigator was the only operator to control interoperator variability. In our study, we also faced similar pitfalls, but needless to say that this design does have its advantages in clinical trials where the patient recruitment is a difficult task, and a lesser amount of patients are needed compared to whole mouth design. However, all the challenges that this design has have to be taken into account by both the clinicians and statisticians. The patients who presented with postoperative tooth sensitivity were recalled at day 7 and then at 1 month intervals and we found that tooth sensitivity tended to decrease with time and none of our patients required any more added interventions. These results are consistent with the study done in Brazil, which concluded that the postoperative sensitivity related to resin-based composite was a time-bound event and gradually decreases with time. We could only locate very few clinical in vivo studies which were done to study the effect of modulated light curing regimes. To study the effect of alternate light curing regimes, Chan et al. evaluated soft-start (pulse-delay) polymerization technique in Class I and II composite restorations. A double-blind, randomized clinical trial was carried out to compare two curing techniques: Soft-start and the plasma arc curing light. The authors concluded that within the limitations of this study, Class I and II restorations placed with a soft start technique did not show significant changes in postoperative sensitivity or decreased signs of marginal stress. These results are similar to the one that we have found. These results may be explained by one study that found that the advantage of initial slow polymerization obtained by the "soft-start" method was offset by a rise in total polymerization shrinkage when final curing was completed at 1130 mW/cm. A similar assumption was also made by Senthil Kumar et al. Keeping the above discussion and contrasting results that were found by Alomari et al. in mind, the results of our study should be considered cautiously and more long-term clinical trials should be done in order to evaluate other clinical parameters of success such as marginal staining and secondary caries, using different cavity designs as well as tooth types. Within the limitations of the current study, we conclude that restorations placed with the soft start curing technique did not show significant changes in postoperative sensitivity when compared with the constant curing technique. More in vivo research is needed to substantiate the potential benefits of this concept. 1. Akpata ES, Behbehani J. Effect of bonding systems on post-operative sensitivity from posterior composites. Am J Dent 2006;19:151-4. 2. Hayashi M, Wilson NH. Failure risk of posterior composites with post-operative sensitivity. Oper Dent 2003;28:681-8. 3. Summitt JB. Fundamentals of operative dentistry: A contemporary approach. Chicago: Quintessence Publication; 2006. p. 289-339. 4. Jain P, Pershing A. Depth of cure and microleakage with high-intensity and ramped resin-based composite curing lights. J Am Dent Assoc 2003;134:1215-23. 5. Heintze S. Systematic reviews: I. The correlation between laboratory tests on marginal quality and bond strength. 2 nd . The correlation between marginal quality and clinical outcome. J Adhes Dent 2007;9:77. 6. De Munck J, Van Landuyt K, Peumans M, Poitevin A, Lambrechts P, Braem M, et al. A critical review of the durability of adhesion to tooth tissue: Methods and results. J Dent Res 2005;84:118. 7. Alomari Q, Omar R, Akpata E. Effect of LED curing modes on postoperative sensitivity after Class 2 nd resin composite restorations. J Adhes Dent 2007;9:477. 8. Wolfart S, Wegner SM, Kern M. Comparison of using calcium hydroxide or a dentine primer for reducing dentinal pain following crown preparation: A randomized clinical trial with an observation time up to 30 months. J Oral Rehabil 2004;31:344-50. 9. Sobral MAP, Garone-Netto N, Luz M, Santos AP. Prevention of postoperative tooth sensitivity: A preliminary clinical trial. J Oral Rehabil 2005;32:661-8. 10. Ramfjord SP, Nissle RR, Shick RA, Cooper Jr H. Subgingival curettage versus surgical elimination of periodontal pockets. J Periodontol 1968;39:167. 11. Lesaffre E, Philstrom B, Needleman I, Worthington H. The design and analysis of split-mouth studies: What statisticians and clinicians should know. Stat Med 2009;28:3470-82. 12. Hujoel PP, Loesche WJ. Efficiency of split-mouth designs. J Clin Periodontol 1990;17:722-8. 13. Antczak-Bouckoms AA, Tulloch JFC, Berkey CS. Split-mouth and cross-over designs in dental research. J Clin Periodontol 1990;17:446-53. 14. Naito T. Postoperative sensitivity in posterior composite restorations is relevant in class 2 nd cavities. J Evid Based Dent Pract 2008;8:225-6. 15. Chan DC, Browning WD, Frazier KB, Brackett MG. Clinical evaluation of the soft-start (pulse-delay) polymerization technique in Class 1 st and 2 nd composite restorations. Oper Dent 2008;33:265-71. 16. Watts DC, Hindi AA. Intrinsic soft-start'polymerisation shrinkage-kinetics in an acrylate-based resin-composite. Dentl Mater 1999;15:39-45. 17. Senthil Kumar S, Chacko Y, Lakshminarayanan L. Microleakage in posterior resin composite restoration using different filling, curing and polishing techniques. J ConservDent 2005;8:52. 18. Opdam NJ, Feilzer AJ, Roeters JJ, Smale I. Class 1 st occlusal composite resin restorations: In vivo post-operative sensitivity, wall adaptation, and microleakage. Am J Dent 1998;11:229.